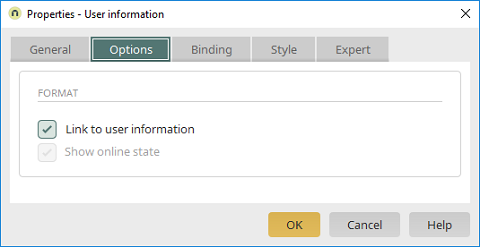 With this setting, the user name will be displayed in the browser as a link to additional information from the User Manager in a popup window. In the default settings, you will find the file "userinfo.vm" in the portal directory internal/system/vm/html/user. With the expert attribute vm-file, an alternative, edited file can be used. Displays a symbol that informs others whether the user is currently online.